On any given day, they might be dressing a wound. Or they might be seeing that computers, phones and other personal property are not left unattended. 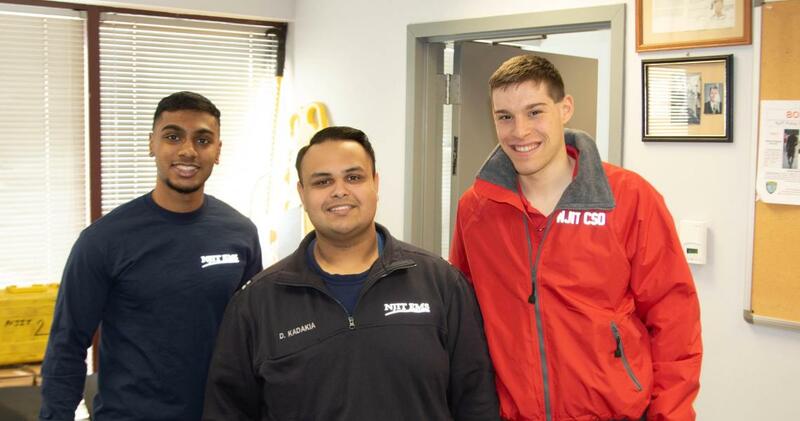 Respectively, they are the student emergency medical technicians (EMTs) and community service officers (CSOs) at NJIT who, as volunteer members of a pilot program/new student club, are helping to make the NJIT campus even safer. The First Aid and Community Service Officer Program, launched this past fall, is overseen by the university’s Department of Public Safety and governed by the Student Senate. Not only does the program contribute to NJIT’s ongoing development of safety initiatives, it also enables participating students to hone their decision-making, communication and leadership skills. “The vision and intention of this program is to afford students at NJIT an opportunity to serve their community at a higher level, while continuing to build their own experience through volunteer service and direct professional experience with a state-accredited police department,” said NJIT Police Chief Joseph Marswillo. Dhwanil Kadakia, a junior studying management information systems, is both captain of the program and a student EMT. He oversees a staff of student line officers that assist him in day-to-day operations. Student EMTs provide a range of medical services, including CPR, defibrillation, bleeding control and other patient-stabilization protocols. They are state- or nationally certified to care for patients while waiting for University Hospital emergency medical services to arrive, and also receive training by the NJIT Police Department, along with student CSOs, in community policing, internal affairs, dealing with hazardous materials and blood-borne pathogens, and more. Kadakia, who has been a volunteer firefighter and EMT in his hometown of Flemington, N.J., since he was 16 years old, spends his administrative time for the program working closely with NJIT police officers, ensuring members’ certifications are up-to-date and coordinating schedules. His EMT duties have involved auto accidents and a variety of other calls. “I think the people that have seen us are very receptive and very welcoming of the program,” he remarked. The same can be said of the CSO side, according to Anastasia Bohon, CSO sergeant and an architecture major graduating this May. She has found that her interactions with other students through the program have helped to get to the roots of problems and their solutions quicker. They have also promoted better awareness about safety and security among students, which she notes facilitates compliance with campus rules and regulations without argument. “[It’s all about] if you work with me, I’ll work with you, and we’re going to get through this together,” offered Bohon, also an Honors College student. Student CSOs are responsible for educating and safeguarding the university community through services that include developing and delivering safety programming, supporting security for special events and providing vehicle and walking escorts. As sergeant, Bohon also works with dispatch and makes certain that student CSOs are following protocol, all while underscoring the importance of giving back. “This isn’t just a resume builder. This is you making a difference in your community. It’s a much higher purpose,” stressed the Boonton, N.J., native, who for eight years has been a volunteer firefighter in her hometown. While the program now has 35 student EMTs and 15 CSOs, recruitment goes on. For student EMTs, shifts vary and scheduling is flexible, but the required commitment is a minimum of 10 hours or two shifts per week. For student CSOs, it’s two three-hour shifts weekly. Anyone interested in becoming a student EMT or CSO should contact EMT/CSO Captain Dhwanil Kadakia at dk423@njit.edu, CSO Student Lieutenant Matthew Rizzo at mpr25@njit.edu, Police Chief Joseph Marswillo at marswill@njit.edu or Deputy Police Chief Kevin Kesselman at kesselma@njit.edu.